Transportation in Kentucky includes roads, airports, waterways and rail. Kentucky is served by six major interstate highways (I-24, I-64, I-65, I-69, I-71, I-75), seven parkways, and six bypasses and spurs. The parkways were originally toll roads, but on November 22, 2006, Governor Ernie Fletcher ended the toll charges on the William H. Natcher Parkway and the Audubon Parkway, the last two parkways in Kentucky to charge tolls for access. The related toll booths have been demolished. Ending the tolls some seven months ahead of schedule was generally agreed to have been a positive economic development for transportation in Kentucky. 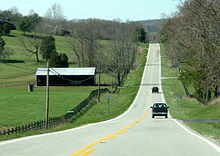 In June 2007, a law went into effect raising the speed limit on rural portions of Kentucky Interstates from 65 miles per hour (105 km/h) to 70 miles per hour (110 km/h). Greyhound provides bus service to most major towns in the state. Amtrak, the national passenger rail system, provides service to Ashland, South Portsmouth and Fulton, Kentucky. The Cardinal, Trains 50 and 51, is the line that offers Amtrak service to Ashland and South Portsmouth. Amtrak Trains 58 and 59, the City of New Orleans, serve Fulton. The Northern Kentucky area, is served by the Cardinal at the Cincinnati Museum Center at Union Terminal. The Museum Center is just across the Ohio River in Cincinnati. As of 2004, there were approximately 2,640 miles (4,250.4 km) of railways in Kentucky, with about 65% of those being operated by CSX Transportation. Coal was by far the most common cargo, accounting for 76% of cargo loaded and 61% of cargo delivered. Bardstown features a tourist attraction known as My Old Kentucky Dinner Train. Run along a 20-mile (30 km) stretch of rail purchased from CSX in 1987, guests are served a four-course meal as they make a two-and-a-half-hour round-trip between Bardstown and Limestone Springs. The Kentucky Railway Museum is located in nearby New Haven. Other areas in Kentucky are reclaiming old railways in rail trail projects. One such project is Louisville's Big Four Bridge. If completed, the Big Four Bridge rail trail will contain the second longest pedestrian-only bridge in the world. The longest pedestrian-only bridge is also found in Kentucky — the Newport Southbank Bridge, popularly known as the "Purple People Bridge", connecting Newport to Cincinnati, Ohio. Kentucky's primary airports include Louisville International Airport (Standiford Field), Cincinnati/Northern Kentucky International Airport, and Blue Grass Airport in Lexington. Louisville International Airport is home to UPS's Worldport, its international air-sorting hub. There are also a number of regional airports scattered across the state. Being bounded by the two largest rivers in North America, water transportation has historically played a major role in Kentucky's economy. 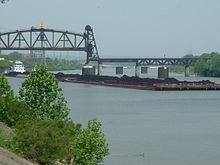 Most barge traffic on Kentucky waterways consists of coal that is shipped from both the Eastern and Western Coalfields, about half of which is used locally to power many power plants located directly off the Ohio River, with the rest being exported to other countries, most notably Japan. The only natural obstacle along the entire length of the Ohio River was the Falls of the Ohio, located just west of Downtown Louisville. ^ Stinnett, Chuck. "Fletcher:Tolls to end November 22". Henderson Gleaner. Archived from the original on 2006-10-08. Retrieved 2007-05-01. ^ Steitzer, Stephanie (2007-06-26). "Many new laws go on books today". Courier-Journal. ^ "Railroad Service in Kentucky" (PDF). Association of American Railroads. Archived from the original (PDF) on 2008-06-24. Retrieved 2007-05-01. Also, Norfolk Southern's main north-south line runs through central and southern Kentucky, starting in Cincinnati. Formerly the CNO&TP subsidiary of Southern Railway, it is NS's most profitable line. ^ Knight, Andy. "On the Right Track - Kentucky Dinner Train serves up railroad nostalgia". Cincinnati.com. Archived from the original on 2000-08-16. Retrieved 2007-05-01. ^ "Kentucky Railway Museum". Retrieved 2007-05-01. ^ Shafer, Sheldon (2007-03-05). "Bridges money may be shifted". Courier-Journal. ^ Crowley, Patrick (April 23, 2003). "Meet the Purple People Bridge". Cincinnati Enquirer. Retrieved 2007-05-01. ^ "Fast Facts". Louisville International Airport. Archived from the original on 2007-06-25. Retrieved 2007-09-11. ^ "Comair Crash Survivor Leaves Hospital". CBS. 2006-10-03. Retrieved 2007-05-01. This page was last edited on 8 March 2019, at 23:11 (UTC).